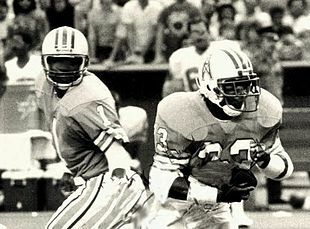 Quarterback Warren Moon (left) and running back Mike Rozier (right) of the Houston Oilers were among the league’s top passers and rushers, respectively. The 1988 NFL season was the 69th regular season of the National Football League. The Cardinals relocated from St. Louis, Missouri to the Phoenix, Arizona area becoming the Phoenix Cardinals but remained in the NFC East division. The playoff races came down to the regular season’s final week, with the Seattle Seahawks winning the AFC West by one game, and the Philadelphia Eagles and San Francisco 49ers winning their respective divisions in a five-way tie, with the New Orleans Saints and New York Giants losing the NFC Wild Card berth to the Los Angeles Rams on tiebreakers. This season marked the final coaching season for the legendary Tom Landry. The season ended with Super Bowl XXIII when the San Francisco 49ers defeated the Cincinnati Bengals 20–16 at the Joe Robbie Stadium in Florida. A standard system of two time intervals between plays are established (and would be timed using the play clock): For normal plays, the offensive team has 45 seconds to snap the ball after the previous play is signaled dead. After time outs and other administrative stoppages, the time limit is 30 seconds beginning after the Referee signals that the ball is ready to resume play. If a fumble occurs during an extra point attempt, only the fumbling player can recover and/or advance the ball. This change closes a loophole in the "Stabler Fumble Rule" that was enacted during the 1979 NFL season in reaction to the Holy Roller Game. The penalty for "Running into the kicker" is changed from five yards and a first down to just 5 yards. Referees were outfitted with white hats while all other officials wore black hats, which was the standard practice in college and high school football. From 1979 through 1987, referees wore black hats while all other officials wore white hats. Johnny Grier became the first African-American in NFL history to be promoted to referee. Grier replaced long time referee Bob Frederic, who retired in the offseason. Grier was the field judge in the previous season's Super Bowl XXII, which was the same game that Doug Williams of the Washington Redskins became the first African-American quarterback to win the Super Bowl. Cincinnati was the top AFC playoff seed ahead of Buffalo based on head-to-head victory (1–0). Indianapolis finished ahead of New England in the AFC East based on better record against common opponents (7–5 to Patriots’ 6–6). Cleveland finished ahead of Houston in the AFC Central based on better division record (4–2 to Oilers’ 3–3). San Francisco was the second NFC playoff seed ahead of Philadelphia on better record against common opponents (5–3 to Eagles’ 5–4). Philadelphia finished first in the NFC East based on head-to-head sweep of the N.Y. Giants (2–0). Washington finished third in the NFC East based on better division record (4–4) than Phoenix (3–5). Detroit finished fourth in the NFC Central based on head-to-head sweep of Green Bay (2–0). San Francisco finished first in the NFC West based on better head-to-head record (3–1) against the L.A. Rams (2–2) and New Orleans (1–3). The L.A. Rams finished second in the NFC West based on better division record (4–2) than New Orleans (3–3), and earned the last NFC Wild Card based on better conference record (8–4) than the N.Y. Giants (9–5) and New Orleans (6–6). A ticket for the AFC Championship Game between the Bengals and the Bills. The 1988 NFL Draft was held from April 24 to 25, 1988 at New York City’s Marriott Marquis. With the first pick, the Atlanta Falcons selected linebacker Aundray Bruce from the University of Auburn. Green Bay Packers: Forrest Gregg left to join the SMU Mustangs. Lindy Infante was named as Gregg's replacement. Los Angeles Raiders: Tom Flores stepped down to move to the team's front office. Mike Shanahan was named as the team's new head coach. Detroit Lions: Darryl Rogers was fired after 11 games and replaced by defensive coordinator Wayne Fontes. ^ "African-Americans in Pro Football". Pro Football Hall of Fame. Retrieved March 28, 2019.